It’s Official – Ron Paul Is Certifiably Crazy. “Just think of what happened after 9/11. Immediately before there was any assessment there was glee in the administration because now we can invade Iraq,” the Texas Republican told a group of mostly young backers in Iowa. He went on to suggest officials are now setting the stage for an invasion of Iran. 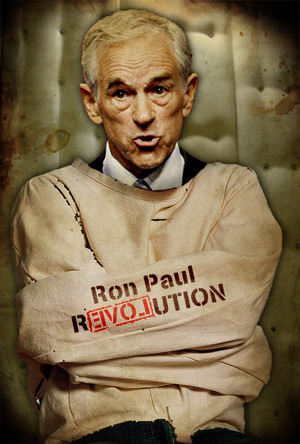 While we accept the fact that Ron Paul has the right to say what he wants, we have the right to call him crazy. Does Paul really believe that any American was glad to see 3000 people die on 9/11? His comments are indefensible and irresponsible, but that is who he is and what he is about. He is just bat-guana crazy. As for our post here, a tip of the “link hat” goes to William Teach over at the Pirate’s Cove for the inspiration. Ron is like the guys from the movie Spinal Tap: always turning it up to 11. He basically has political tourettes. This story is so nuts that it really does make me angry. If Paul had any principles, he would simply leave the Republican Party. He basically hates everything the party has stood for or done. He resigned once because of Regan and now says he loves him. For those who think Paul is some kind of “savior:” or political “fresh air,” it is because seldom have we ever seen some one so out in left field as he it. Oh, AA… he leaves every time he doesnt get the nomination. He’s already stated that if he doesnt get it, he wont support the nominee. Essentially, he’s in this for himself [as it tends to be with most cult leaders] and not for the good of the country. He knows Obama is ruining America and pretty much anybody running for the GOP nomination now [with the exception of him] would be better, but he would rather take his zombies and let Obama stay in power than to side with Republicans, unless they give him what he wants. That right there speaks volumes about the little goon. the attacks with Saddam Hussein as well as Osama Bin Laden. “Best info fast. Judge whether good enough [to] hit SH at same time – not only UBL [Pentagon shorthand for Usama/Osama bin Laden],” the notes say. “Tasks. Jim Haynes [Pentagon lawyer] to talk with PW [probably Paul Wolfowitz, then Mr Rumsfeld’s deputy] for additional support … connection with UBL.” Rumsfeld also wrote in his memoirs, Known and Unknown, released earlier this year, that he was asked by the president to draw up plans for the invasion of Iraq just two weeks after the attacks. Thousands of de-classified documents accompanying the memoirs also revealed that Rumsfeld and his Pentagon aides were planning for regime change in Iraq BEFORE 9/11. “If Saddam’s regime were ousted, we would have a much-improved position in the region and elsewhere,” Rumsfeld wrote in a memo to Condoleeza Rice dated July 27, 2001. Bush’s comment of “I hit the trifecta” is without context and always has been. As for the Rumsfeld quotes, your position is typical of Ron Paul and his supporters. You believe everything happens in a vacuum. The UN had been literally sparring with Saddam for the past 10 years. In that time, Saddam had not cooperated with the UN inspectors. If the US could tie Saddam to 9/11, that would be a major development as certainly the administration was tired of Saddam not living up the the UN cease fire agreement. It should be remembered that was the same position as the Clinton administration as well. If you think that means the administration was “gleeful,” you are simply deluded. Oh, and by the way….. “infowars” as a source? That’s funny. Its odd that I read and hear so much about how bad Ron Paul is now that he is getting his numbers up. not that i follow him or that im hell-bent to vote for the man but its just weird, I’ve never heard the Gov. of Iowa say “…nobody pays attention to the first place. They notice second and third.” WHAT?!?!? Never,… but hey maybe damn near it everyone else here in Iowa is crazy right? It is not weird when you consider how the people who like Ron Paul are typically young and well versed in social media. When there is a poll on a website, they flood the poll. They have been very effective on concentrating on how Paul is doing, rather than his positions on various subjects. We saw the same sort of thing with Obama and look how that is turning out.